JEE Advanced Exam Pattern 2019: Rift between the center and the IITs are growing day by day, but you as a student/ candidates not to worry about this thing instead of your JEE Advanced Preparation. Whatever the outcome will be, but the basic thing is that the syllabus and exam pattern is expected to be very much same as we have seen in the case of JEE Main Exam Scheme. Joint Entrance Examination Advanced is commonly known as JEE Advanced. It is a national level entrance exam. JEE Advanced Examination held through 2 papers, on the same day. Both Papers have their separate Exam Pattern but Common subjects i.e. Physics, Chemistry, and Math. 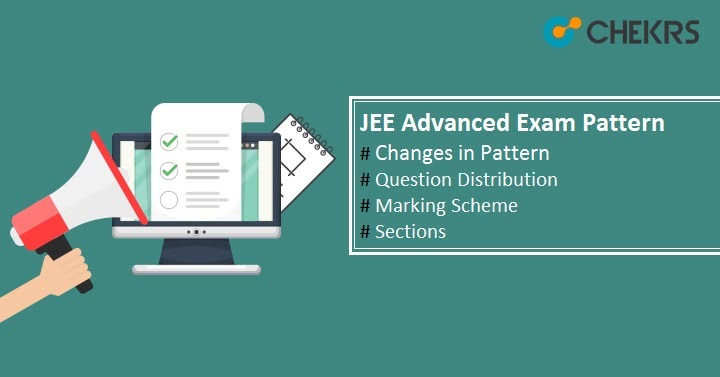 Due to the complication of the exam, we are trying to help you in your preparation and hence we are providing JEE Advanced Exam Pattern and Changes in JEE Advanced 2019 in a separate article here. There are some changes in JEE Mains 2019 like, it will be conducted twice in a year by a new examination body NTA. But there are no NTA New Changes in JEE Advanced announced yet. So possibly there is no change in JEE Advanced Exam Pattern 2019 also. The Big point is that Indian Institutes of Technology which are well reputed in the country and worldwide are refusing to change their entrance exam as per NTA. The outcome will be announced very soon but till then let’s focus on our preparation and JEE Advanced Exam Pattern. The JEE Advanced Papers will be conducted in a single day in two session. First session will probably start from 10AM and second session will start from 2PM. We are providing JEE Advanced Paper Wise Pattern. You can get details from it. The Paper will be in Hindi and English both languages. The JEE Advance Papers will consists of MCQ & Numerical answer type questions. Marking Scheme Full marks, Partial marks, Zero marks and Negative marks. There will be three sections. Section 1 will be of Mathematics, Section 2 will be of Aptitude Test & Section 3 will be of Drawing Test. The number of questions and marks are listed below. *Note: The Exam Pattern, Mark & Question Distribution and JEE Advanced Exam Scheme can be only confirmed at the time of the exam. It could be changed by the Official authority. So we have provided you JEE Advanced Exam Pattern now it is time for the JEE Advanced 2019 Syllabus, So for Syllabus, you can use official notification and then on our site. The Papers will consist Questions from Chemistry, Physics, and Mathematics. For JEE Advanced AAT Exam Question will be asked from Exercises in geometrical drawing containing lines, Composition exercise with given elements, Context mapping, angles, triangles, Understanding and appreciation of three-dimensional forms, etc.